Beyond Meat burgers are all. the. rage. right now. They’re the ones that surprisingly similar to real meat… but aren’t. Let’s just say that they’re next level good. Lucky for us, they’re available at all SPUD, Blush Lane, and Be Fresh stores now (hooray!). These delicious burgers are juicy, flavourful, and meaty, but let’s be real: sometimes you just don’t feel like a burger. That’s where this recipe comes in. While you could make some Beyond Meat-balls, sometimes you need an extremely quick and satisfying dinner. So, if you want to simplify your dinner by a few steps, then this one’s for you. It takes about 15 minutes, is delicious, and 100% vegan. 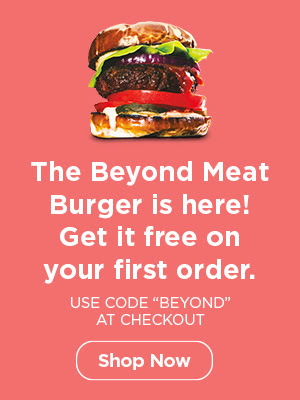 More ways to eat these Beyond Meat burgers? Sign us up! Follow these easy steps below for an easy and delicious dinner. This recipe serves two, but feel free to double up quantities to serve more. This fast, easy and delicious plant-based ragù recipe will become a family favourite! Optional: experiment and add whichever veggies you like! Diced carrots, peppers, or mushrooms all work well. Optional: cheese of your choice to grate and top pasta with. Nutritional yeast is also delicious. Heat oil in a medium-large pan. Saute onion and garlic. Cook for a few minutes, or until onions start to turn translucent. Season with S&P. Add additional veggies if using. Meanwhile, bring a pot of water to boil. To your sauteed veggies, add your Beyond Meat patty. Crumble it up with a wooden spoon until it has a ground beef-like texture, and mix well into the onion/garlic/veggie mix. Cook on low-medium heat until meat has cooked properly – around 5 minutes or so. In the meantime, check on your pot of boiling water. Once boiled, add pasta and follow instructions on package. Once the meat has cooked properly, add your tomato sauce to the mixture. Turn heat to low/simmer. Stir until tomato sauce is well-incorporated with the meat and veggies. Remove from heat once the sauce is heated through. Strain pasta and add to the mix. Incorporate well, serve, and enjoy! Top with cheese of your choice if you like. Have any other inspiring recipes that use the Beyond Meat burger patties? Let us know! previous post: DOES IT MATTER IF YOUR CHOCOLATE IS FAIR TRADE?